Four PPSU personnel under Cipulir Urban Village is repairing a water channel's sheet pile on Jalan Kebayoran Lama, RT 03/02.
" 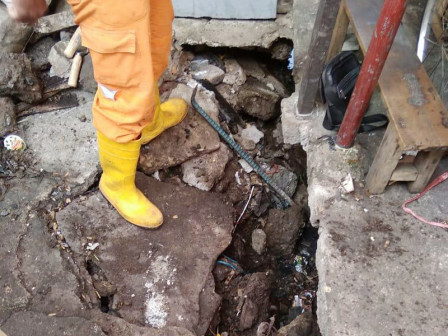 The length of the channel is about 2 meters with 40 centimeters width"
Cipulir Urban Village Head, Adi Krisno Prayogo stated, prior to repair, the sheet pile was cleaned from mud and trash. "The length of the channel is about 2 meters with 40 centimeters width," he expressed, Tuesday (11/13). It is done by using cement, sand, and brick making to further strengthen the sheet pile. It is carried out in the next two to three days. "Hopefully it can accommodate water in large quantities, as well as can minimize puddles and floods," he hoped.